How do you get emails in the Kanban Card? How to send emails from the Kanban card? How do I Create/Update cards over email? When you integrate Kanbanize email address or your own custom domain email address to Kanbanize, you can process, track and store your email correspondence on the Kanban board. The Kanbanize Email Integration feature hooks your inbox to your Kanban board/s and every email you receive will be transformed into a Kanban card. 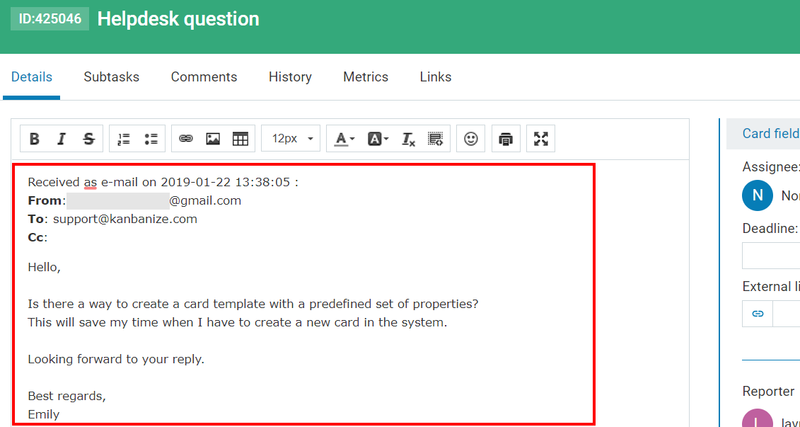 Moreover, you can reply to emails from the kanban card itself. The original email (the email body) is delivered in the Details (description) of the Kanban card. To Reply back an email from the card -> open the Comments tab of the card and press "E" to open the email mode of the card and to add an email (img.1). 1. How to send an email from the card? The Email Subject is at the top of the card (1). Use the drop-down menu in the "From" ** filed (2) to select an email that your recipients will see. In the "To" field (3), enter the email of the recipient. If you want to send an email to multiple recipients, you can add each email address to the "To" field. The Comments text box where you create your message supports rich text with custom text formatting such as: Bold, Italic, Underlining, text color, size, etc. The email message can include images and links. You can also attach files to a message (4). Press Add Comment (5) to send an email. - to find out how does email thread get displayed on the card (p.5). How does email thread get displayed? - companydomain_notifications@kanbanize.com - this is a default e-mail address and no additional justifications are required. You can send emails to anyone (external email and/or a registered user within the account). IMPORTANT: If you send emails from companydomain_notifications@kanbanize.com to external users and they reply back, their answer will be lost. 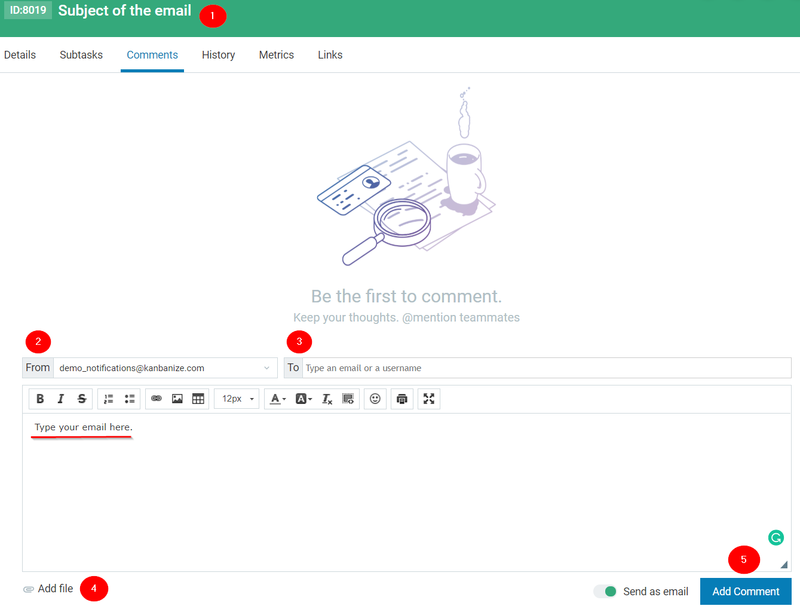 The notifications email is used mainly for notifications purposes and communication inside the team (users registered within Kanbanize). If you want to send emails to non-registered users and respectively keep your email thread within the card Comments tab, you should first have integrated and set up an email specifically for this case (Administration -> Email Integration-> Add new receiver). support_companydomain@kanbanize.com - the system allows you to have several Kanbanize email addresses. support@companydomain.com - this is your registered email in Kanbanize or the one that you have registered in Kanbanize for that purpose. Note: You need to set up a forwarder and an SPF record in order to be able to send emails directly from the card. 3. How does the email integration work for Internal User? If you select E (send as email) you can send an email directly to the card creator - a registered Kanbanize user. The system will automatically add a recipient - this will be the username of the card author. Create your message and click on "Add comment" button to send it to that user. 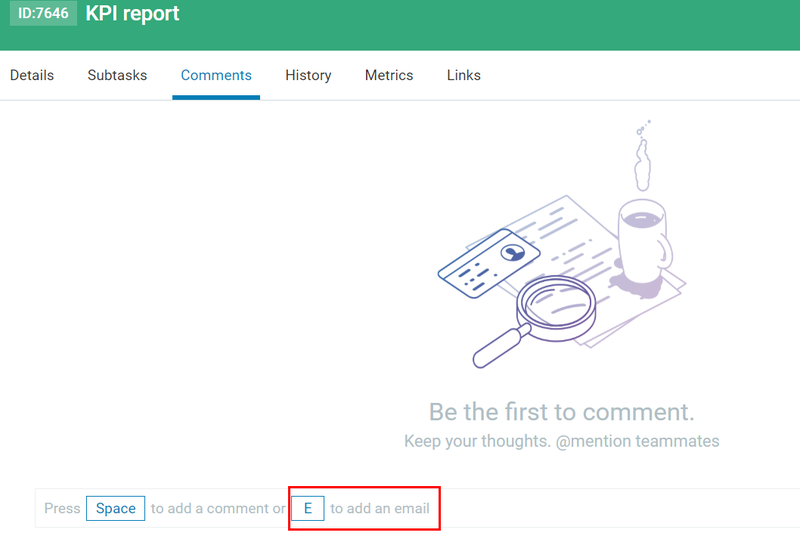 How to @mention a user in Kanbanize via the card?